At Accu-Chek, we believe that all people with diabetes deserve the best healthcare. With 30 years experience in insulin pump therapy, our purpose is to support people at every step of their journey with diabetes, helping them to live a less restricted life. Whether you already wear a pump or are considering one for the very first time, Accu-Chek insulin pump systems and their easy to use technology may make managing your diabetes simpler. We want to give people choice so that they can select the best pump to suit their needs. This is why we offer two different insulin pump systems - the Accu-Chek Combo and the Accu-Chek Insight. The Accu-Chek Combo insulin pump system is completely discreet, customisable to your needs and simple to use - and it fits in the palm of your hand. The idea of changing the way you give your insulin can be daunting. Switching from injections to a pump is a significant adjustment, so you will need to work with your diabetes team to evaluate your options and make a decision as to whether pump therapy is right for you. Insulin pump therapy is not just a health decision, it is a lifestyle choice. At Roche, our aim is to support you at every step of your journey with diabetes, helping you to live an unrestricted life – and our insulin pumps are designed to do just that. An insulin pump is a small electronic device, about the size of a pack of cards, which is programmed to release small amounts of insulin throughout the day as needed. You can also easily give yourself extra doses of insulin to account for high blood glucose levels and carbohydrate intake. 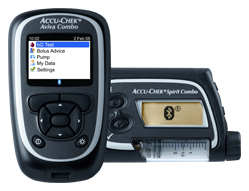 Accu-Chek insulin pumps are two part systems which consist of the insulin pump itself and a remote control handset. The insulin pump holds a cartridge of insulin and is connected to the body by a small cannula and a thin tube. The handset can be used to discreetly control the pump, so you can deliver insulin without needing to get the pump out or to inject. 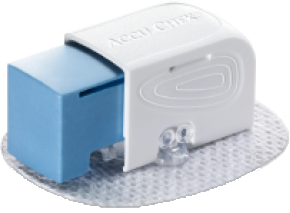 It also incorporates the same clinically proven bolus advisor1-4 that you are used to with the Accu-Chek Aviva Expert, to make your transition to the insulin pump simpler. Having diabetes doesn’t mean giving up all the things that you enjoy in life. With an insulin pump, you can live a flexible and independent life, eating what you want, sleeping late at the weekends, playing sports with friends, seeing the world and enjoying a normal family life – all while keeping your blood glucose levels under control. Exercise also means changing blood glucose levels. During any kind of increased physical activity your blood glucose levels drop as your body works harder and uses up more glucose, so your body needs less insulin. This means that during exercise you need to adjust your insulin intake to maintain blood glucose control, especially when taking part in high-intensity exercise or exercising for a long time. An insulin pump provides one of the best and easiest ways to match your insulin needs during exercise. Your pump allows you to quickly and precisely adjust your insulin levels before, during and after exercise, to carefully match your individual needs. All Accu-Chek insulin pumps are suitable to use during most types of exercise. If you’re new to a pump it’s a good idea to talk to your healthcare professional about how to handle your needs for exercise with the pump before you get started. Using an insulin pump means you can stay more in control of your blood glucose levels – even while you are sleeping. Your pump supplies a continuous dose of insulin at a preprogrammed rate to keep blood glucose levels at an optimum level. This means you can even sleep late in the mornings without the need to wake up early for an injection. It’s up to you where you put your pump at night. You can clip it to your pyjamas, put it next to you in bed, or even put it in a pocket. You’ll soon find you don’t even notice it’s there. Your insulin pump is a great travel companion. It can help keep your blood glucose levels under control, even when you have to deal with delayed meals, eating and sleeping at odd hours or an unfamiliar diet. Wherever you are going on your travels, it always pays to plan ahead; even more so when you wear an insulin pump. This is especially important with the increased airport security we have nowadays. For more advice, take a look at the Accu-Chek Combo Travel Guide or the Accu-Chek Insight Travel Guide. Whether you drive for fun, convenience or work, having diabetes doesn't mean you have to give up driving – but it does mean you have to be well prepared and well controlled. There are, however, some important legal and health issues you should know about. Please see the driving and diabetes section of our website for more information about the regulations you need to be aware of. An insulin pump can make managing your child’s diabetes easier for them, you and the staff at their school. During the school day, children take part in a variety of activities that can have an effect on their blood glucose levels. The major benefit of wearing an insulin pump is that your child does not need to inject, or be injected by a teacher or school nurse, while at school. It is also very easy for the insulin to be reduced for any physical activity, i.e. PE lessons, that your child takes part in. 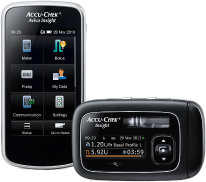 The added benefit of using an Accu-Chek insulin pump is that it can be controlled discreetly from the handset. This means that, not only does your child not need to inject during the school day, they do not even need to get the insulin pump out of their clothes to deliver insulin or make changes to the basal rate. For more advice, and support for your child’s teacher, you can obtain an Accu-Chek School Care Plan from your healthcare professional when your child starts on their insulin pump. Insulin pump therapy can help you control your blood glucose levels both during pregnancy and after the birth of your baby, when your insulin needs will change dramatically with your fluctuating hormone levels. As well as morning sickness, tiredness and odd food cravings, diabetes can add a few extra things to the list of challenges facing an expectant mother. During pregnancy, your body goes through many changes that affect your insulin need, so it’s essential to keep your blood glucose levels under tight control. Careful management of your blood glucose can also reduce the risk of complications for both you and your baby. That’s where an insulin pump can be invaluable. The ability to monitor constantly and make even the smallest of insulin dose adjustments can really help when your body’s blood glucose levels are changing frequently throughout your pregnancy. Once your baby has arrived and you’re at home, unpredictable sleeping and eating schedules can often be managed more easily with insulin pump therapy, making your first few weeks together much more enjoyable. Cavan D et al, Use of insulin bolus advisor improves glycemic control in multiple daily injection (MDI) therapy patients with suboptimal glycemic control: First results from the ABACUS trial. Diabetes Care 2013; 36 (1): 3613 – 9. Kerr D et al. Multicenter user evaluation of Accu-Chek® Combo, an integrated system for continuous subcutaneous insulin infusion (CSII), J Diabetes Sci Technol. 2010; 4(6): 1400 – 1407. Lenhard MJ et al. Continuous subcutaneous insulin infusion: a comprehensive review of insulin pump therapy. Arch Intern Med 2001; 161(19): 2293 – 2300. Liebl A et al. Long-term results of insulin pump therapy (CSII) in adolescents and adults with type 1 diabetes mellitus in Germany. Diabetologia polska 2003; 10(1): 179 – 185. Linkeschova R et al. Less severe hypoglycemia, better metabolic control, and improved quality of life in Type 1 diabetes mellitus with continuous subcutaneous insulin infusion (CSII) therapy; an observational study of 100 consecutive patients followed for a mean of 2 years. Diabet Med 2002; 19(9): 746 – 751. Jeitler K et al. Continuous subcutaneous insulin infusion versus multiple daily insulin injections in patients with diabetes mellitus: systematic review and meta-analysis. Diabetologia 2008; 51: 941 – 51. Pickup JC et al. Severe hypoglycaemia and glycaemic control in Type 1 diabetes: meta-analysis of multiple daily insulin injections compared with continuous subcutaneous insulin infusion. Diabetic Medicine 2008; 25: 765 – 774.